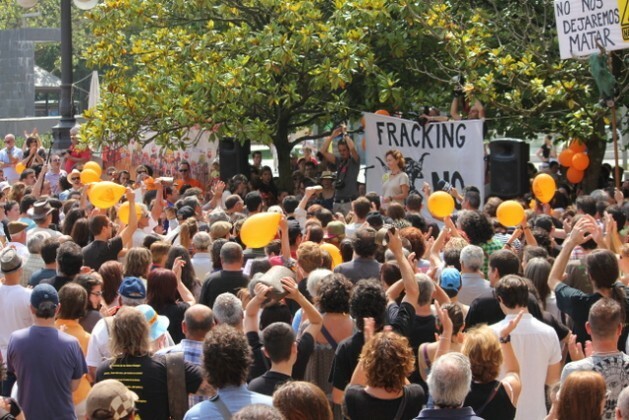 MALAGA, Spain, Jun 2 2015 (IPS) - Thousands of people in Spain have organised to protest the introduction of “fracking” – a controversial technique that involves pumping water, chemicals and sand at high pressure into shale rock to release gas and oil. “We are all different kinds of people, local inhabitants, who love our land and want to protect its biodiversity,” activist Hipólito Delgado with the Asamblea Antifracking de Las Merindades, a county in the northern province of Burgos, told Tierramérica. The company BNK España, a subsidiary of Canada’s BNK Petroleum, has applied for permits to drill 12 exploratory wells and is awaiting the environmental impact assessment required by law. 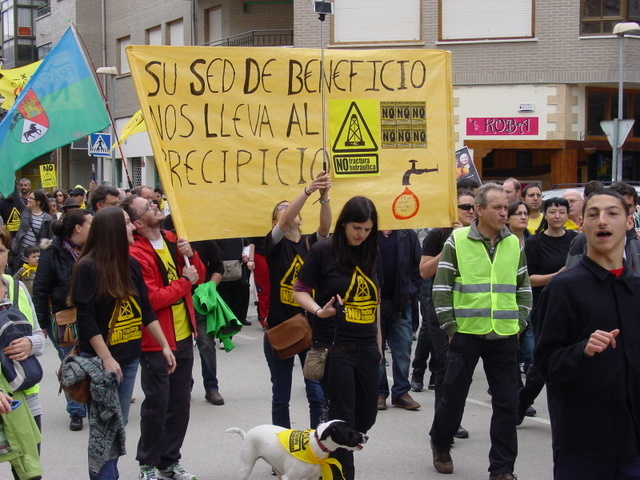 On May 3 some 4,000 people demonstrated in the town of Medina de Pomar in the province of Burgos, demanding that the government refuse permits for exploratory wells because of the numerous threats they claimed that hydraulic fracturing or fracking posed to the environment and health. While no permit for fracking has been issued yet in Spain, 70 permits for exploration for shale gas have been granted and a further 62 are awaiting authorisation, according to the Ministry of Industry and Energy. “Thanks to the fight put up by local inhabitants, “a permit for exploration in the northern region of Cantabria was cancelled in February 2014, activist Carmen González, with the Asamblea Contra el Fracking de Cantabria, an anti-fracking group mainly made up of people from rural areas in that region, told Tierramérica. Critics of fracking say it pollutes underground water supplies with chemicals, releases methane gas – 25 times more potent than carbon dioxide as a greenhouse gas – into the atmosphere, and can cause seismic activity. Only four right-wing and centre-right parties, including the governing People’s Party, which is promoting unconventional shale gas development, refrained from signing the accord. Fracking involves drilling a vertical well between 1,000 and 5,000 metres deep, down to gas-bearing layers of shale rock. Then the well is extended horizontally up to three km, and between 10,000 and 30,000 cubic metres of water, sand and chemicals are injected at high pressure to fracture the rock and release the oil and gas, which along with the additives is pumped up to the surface. The companies interested in fracking in Spain downplay the dangers and stress this country’s shale gas potential, especially in Cantabria, the Basque Country and Castilla y León – where Burgos is located – in the north, although exploration permits have also been granted in other regions. “Like any activity it involves risks, but the technological advances make it possible to minimise them,” said Daniel Alameda, director general of Shale Gas España, a lobbying group for prospectors in Spain. He argued that it is “technically impossible” for fracking to pollute aquifers since the hydraulic fracturing takes place some 3,000 metres below the underground water reserves, and the wells are isolated with a protective barrier of steel and cement. “It’s a load of eyewash to say fracking doesn’t pollute,” activist Samuel Martín-Sosa, international coordinator at Ecologistas en Acción, told Tierramérica. He pointed out that a court sentence has already been handed down against fracking, in the U.S. state of Texas, where an oil company was ordered in 2014 to pay damages to a family who suffered numerous health problems because of the proximity of a number of natural gas wells. Shale Gas España also denies any link between fracking and seismic activity. “We don’t cause earthquakes. We have all of the tools necessary to ensure that the activity does not pose a threat to local residents or to the companies themselves,” Alameda said. But in a 2014 document, the Geological and Mining Institute of Spain warned that fracking could cause radioactivity in water, pollute aquifers and the atmosphere, and cause earthquakes. Martín pointed out that most lawsuits never make it to trial because the companies reach out-of-court settlements containing confidentiality clauses that prevent those affected by the wells from speaking out. The United States is the world’s leading producer of shale oil and gas, followed by Argentina. In July 2011 France became the first country in the world to ban fracking, and 16 other European Union countries have since followed suit, while Spain and 10 others permit the use of hydraulic fracturing, with the United Kingdom in the lead. Alameda said shale gas would create jobs, reduce energy dependency and improve the country’s trade balance. Spain imports around 80 percent of the energy it consumes, according to statistics from the 2011-2020 Energy Efficiency and Savings Action Plan. Those involved in the exploitation of unconventional gas estimate that their wells will make the country self-sufficient for 90 years – although that can only be proven through exploration. But to reduce dependency, “the way forward is not the extraction of gas; we can’t allow the continued burning of fossil fuels,” said Martín-Sosa of Ecologistas en Acción. The environmentalist criticised “the absolute promotion” of shale gas by the government, when what is needed, he said, is “a change in energy model” starting with the replacement of fossil fuels by renewable energy sources. But clean energy “faces more hurdles than ever” from the national government, he complained. In 2013 and 2014, four of Spain’s 17 “autonomous communities” or regions passed laws banning fracking. But the central government introduced changes in the authority over the development of fracking, which allowed the regional laws to be revoked by the Constitutional Court. Martín-Sosa said that what is needed is a national ban on fracking, rather than attempts to regulate it.